President Trump has achieved a remarkable victory. For over 25 years, the foreign policy establishment — an alliance of neoconservatives and liberal internationalists — has imposed its will on America and the world. At Helsinki and the NATO summit, Trump overturned that agenda. This is the real reason why the mainstream media and the Washington establishment is melting down. Trump is being denounced as a “traitor” and a “poodle” of Russian President Vladimir Putin. Former CIA Director John Brennan tweeted out that Trump’s performance at Helsinki revealed he was an agent of Putin, who must be impeached. CNN analyst and former CIA operative, Philip Mudd, went even further. He called for the “shadow government” — the FBI, CIA, NSA and the rest of the deep state — to “rise against” Trump. In other words, Mudd on CNN, with the full approval of host Anderson Cooper, urged a palace coup to overthrow Trump from power. The reason: Trump refused to publicly support our intelligence community’s claim that 12 senior Russian military intelligence officials had hacked into the Democratic National Committee and the Hillary Clinton campaign during the 2016 election. For this alleged crime, the president is being vilified and slandered not just by the media, but by Beltway Republicans and Democrats. Minority Leader Chuck Schumer took to the Senate floor to claim — without any evidence — that Putin “must have dirt” on Trump, which explains the president’s refusal to call out Russia. In short, a dark picture is being painted of Trump as an agent and spy for the Kremlin. It is the craziest and most kooky conspiracy theory ever peddled: The U.S. president as the ultimate Manchurian candidate. Yet, this is what the media and the political class want us to believe. Which begs the question: Why should Trump believe his own intelligence community? This is the same deep state that, for the past two years, has sought to bring him down. In fact, just prior to Special Counsel Robert Mueller’s indictments of the 12 Russian intelligence officers, FBI Agent Peter Strzok testified in front of a joint congressional committee. Strzok’s fanatical hatred for Trump was clear; his effort to rig the investigation into Hillary’s email scandal was laid bare; and his determination to make sure that first, Trump was defeated in 2016 and then, later, tainted with the Russia-collusion narrative was made obvious to the country. Key members within the intelligence community — Strzok, James Comey, Andrew McCabe, Lisa Page, John Brennan, James Clapper, Bruce Ohr — were determined to frame Trump as Putin’s handmaiden. Since his election, the deep state has sought to delegitimize Trump’s victory. He would be a fool to trust these pro-Hillary traitors now (for example, Comey is urging all voters to support the Democrats in November). 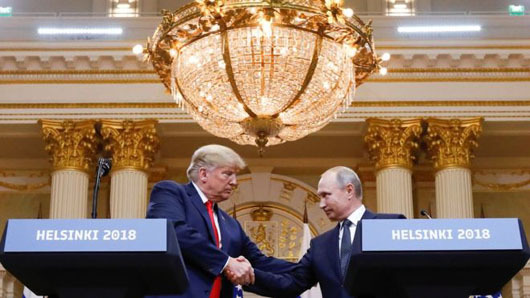 Moreover, what concrete U.S. interests did Trump surrender to Putin at Helsinki? The answer is a simple one: none. Trump did not recognize Moscow’s annexation of Crimea. He did not betray eastern Ukraine to the pro-Russian rebels. He did not agree to pull U.S. forces out of Poland and the Baltic States. And he refused to give Russia a free hand in Syria. Contrary to the media’s lies, Trump has been much tougher on Putin’s Russia than former President Obama. Unlike Obama, Trump has sent Ukraine lethal defensive weapons — effectively blocking Moscow’s expansionist ambitions in Eastern Europe. His administration has imposed suffocating, crippling sanctions on Putin’s inner circle. Trump has rebuilt the U.S. military into the world’s mightiest fighting force. He has unleashed American oil and natural gas production, thereby countering Russia’s rise as an energy superpower. In Syria, Trump pressed Putin at Helsinki to cooperate with the United States to push out Iranian military forces and its militia proxies, such as Hizbullah, from the border areas with Israel. Trump’s goal: to drive Iranian influence out of Syria — something Obama was unable or unwilling to do. More importantly, Trump has done the unthinkable: He has repudiated the globalist project of the past three decades. Since the end of the Cold War, U.S. elites have attempted to erect a New World Order. At the heart of this has been the effort to permanently contain Russia. Call it Cold War 2.0. Hence, NATO expansion was pushed into Eastern Europe; NATO forces and military bases were installed on Russia’s doorstep in Poland and the Baltic States; the ABM Treaty negotiated by President Richard Nixon was abrogated; a revolution that overthrew the legitimate and democratically elected pro-Russian government in Kiev was supported and financed by the State Department and CIA; and our media — through relentless propaganda — has turned Putin into a caricature of a James Bond villain, something resembling Dr. Nyet. In short, the aim has been to encircle Russia and detach it from the Western camp. Trump has begun to reverse all of this. At the NATO summit, he rightly declared that the days of our European allies free-loading off of the United States are over. America pays for nearly 90 percent of Europe’s defense, while the European Union rolls up massive trade surpluses at our expense. As Trump put it, either NATO nations start contributing at least 2 percent (and as high as 4 percent) of their GDP to military spending or the United States will withdraw its 35,000 troops from Germany. Trump’s message: NATO is becoming obsolete and an unsustainable burden for U.S. taxpayers. Trump is also (finally) repairing relations with Russia. He is determined to pursue détente. The fact is that on many issues — ISIS, Islamic terrorism, Syria, containing the emergence of China as a superpower, stopping the proliferation of nuclear weapons — Putin is a natural ally. He may be an authoritarian, but Putin is also a Great Russian nationalist who is an Orthodox Christian, an anti-globalist and a fierce opponent of radical Islam. In Syria, for example, Russian and U.S. forces have helped to eradicate over 98 percent of ISIS. It was Russian intelligence that warned the FBI about the Boston Marathon bombers (which the bureau ignored). The Soviet Union disintegrated nearly three decades ago. The Warsaw Pact is no more. Communism in Russia is dead. The Europeans no longer fear that Putin will march the Russian army across Eastern Europe; rather, their primary fear is the Muslim invasion from North Africa and the Middle East. Our elites refuse to recognize that the world has changed. NATO, the EU, the United Nations — they are outdated transnational institutions rooted in a bygone era. Putin understands this. More importantly, so does Trump. And at Helsinki, Trump finally brought Russia in from the cold. The age of globalism is over. A new era of nationalism and populism has begun.